Non Player Characters. You’ve all seen them. They stand forlornly at the gates to a town, or forever staring out from behind their desk in the Dungeon Mart. From the old wizard in Zelda who tells you ‘It’s Dangerous To Go Alone’ to the street vendor yelling out ‘Hot Walnut!’ in Baldur’s Gate, you can’t play an RPG without encountering one. 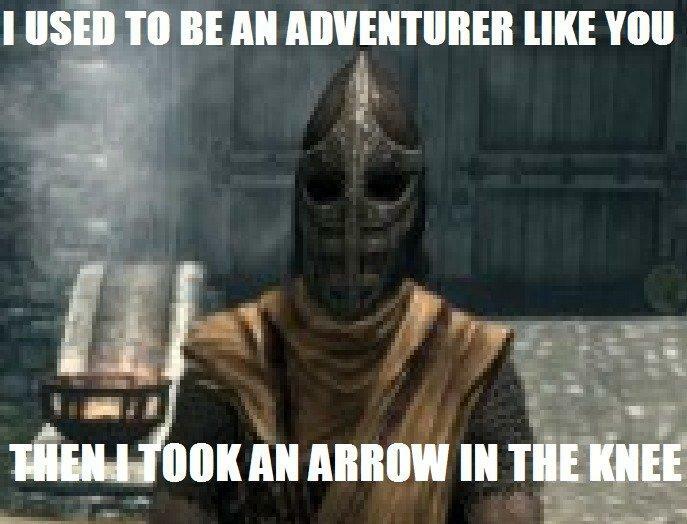 This line of conversation was so commonplace in Skyrim, it actually became a meme. That’s a problem if you’re trying to make a plausible and complex game world. The worst part about all of this was that different guards in completely different areas of the world all said the same thing. What starts as a charming, offhanded remarks becomes an illusion shattering problem. So this is a bit of an extreme example, but generally NPCs look and act as if you barely exist in the world. In an ideal situation that same guard would be gruff with you the first time you met, then upon recognising you later, warm to you and then mention the knee injury. Were you to not meet them again for several months, maybe they’d give a friendly wave. Or perhaps they’d barely remember you and be gruff again. Maybe tales of your heroic adventures have reached them and might hail you as a hero! Or, perhaps they are too humble/shy to interact, lowering their eyes as you pass. It’s probably three times the dialogue to write but it would make the guard a much more memorable character. Writing lots of meaningful dialogue is often a logistical issue – it is time consuming and complex. However, so is modelling textures and everything else to do with building a game. Good dialogue for your NPCs sadly often treated as an afterthought in a lot of modern RPGs. Many of these games don’t suffer from a lack of dialogue, ( there’s many volumes of text to read through in some cases ) but so much of it is irrelevant to the player. Less dialogue , more tailored to the present situation , would invite players to interact with NPCs without the skepticism of knowing most of your interactions are meaningless. Richard was obsessed with making his worlds intricate and detailed. Every item in the game had a weight, the sun and moons rose and set, waxed and waned and had effects on the citizens of his worlds. NPCs had their own schedules and lives. Arguably the best of the Ultima series was Ultima VI: The False Prophet, in which the player set out to settle a conflict between humans and gargoyles – the game touched heavily upon prejudice and racism rather than the invariable Kill Foozle quests that so dominate most RPGs. In order for Garriott and his team to tackle such an important subject, they tried to make their world and the inhabitants within as believable as possible. Now, bear in mind this game was made some 25 years ago, in 1990. As far as I’m aware, it was the first game to make its NPCs dynamic characters. No longer would a baker forever sit at his mill baking, waiting for the player to come along and buy a loaf of bread. In the early morning the baker would rise from his bed, head to his mill up the road and bake bread until mid morning. He’d then head to the pub for a few hours, returning to his mill in the afternoon and then back home in the evening. If the player were to meet the baker in the pub, he would ask you to come and visit his shop later, and perhaps instead tell the player some gossip about another member of the town. Another NPC, this one in the town of Yew, would visit his brother locked in jail every morning and night. Following this NPC from the tavern to the jail would lead the player to a quest to perhaps free his imprisoned brother. Emergent gameplay happens this way. Characters spouted hundreds of lines of dialogue – however much of this was only revealed when the player had interacted with them correctly. A wizard might only tell the player about his observatory if the party had already visited his daughter in the conservatorium, who mentioned it previously. 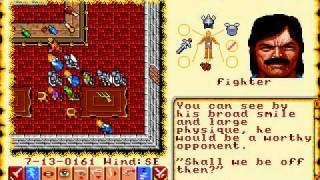 Ultima VI ( and its successor Ultima VII ) did a great job of making the NPCs in your party feel alive too. Players turning on beer kegs with no mug under them would hear a dismayed “Waste that not!” from an ale loving companion. In colder climates , companions would utter “Tis colder”. These little interactions make your party so much more than just a series of stats and numbers, but living breathing companions who you care for, fight for and grieve for. You can take a lot of lessons from both Skyrim and Ultima. Skyrim, in my opinion, did dialogue the wrong way. Thousands of characters, most as generic as the last, spouting the same tired lines again and again, no matter where you were in the world. Ultima, for all it’s age, handled it the right way. Fewer citizens, but each a living, breathing, memorable digital person. In my own in-development RPG, Ships and Scurvy, the player and their crew embark on many adventures on the high seas, encountering pirates, cannibals, traders, the royal navy, marooned sailors – there’s plenty of opportunity for interesting dialogue. I’ve been thinking a lot about how I could implement some of these lessons into my own game. If possible, I want to avoid the problem of repetitive dialogue. A guard on one island should have different dialogue to a guard on another. I’ve decided to set up a template for conversations, loosely based on Ultima VI’s premise of ‘Name’, ‘Job’ and ‘Bye’ – the player can ask the NPC who they are, what they do, and then say farewell. Some NPCs will respond to the player well or poorly depending on their reputation. If you’re the scourge of the high seas, you won’t get on well with a fishmonger on the royal navy island for example. I’ve considered the idea of having some NPCs , particularly natives on islands, not being able to speak to a player at all because of a language barrier. Perhaps you need to learn the island’s native tongue before you can interact – or even have an interpreter in your crew. Conversations themselves will be a series of option boxes with text, to which the NPC can respond although I’d like to have flags set so characters, once they’ve said their peace, will not keep repeating themselves. Although dialogue repetition is probably inevitable, having a random amount of responses to the same question will keep that illusion of NPC depth intact.